Luxury meets natural meets effective. Can you say that about your current deodorant? 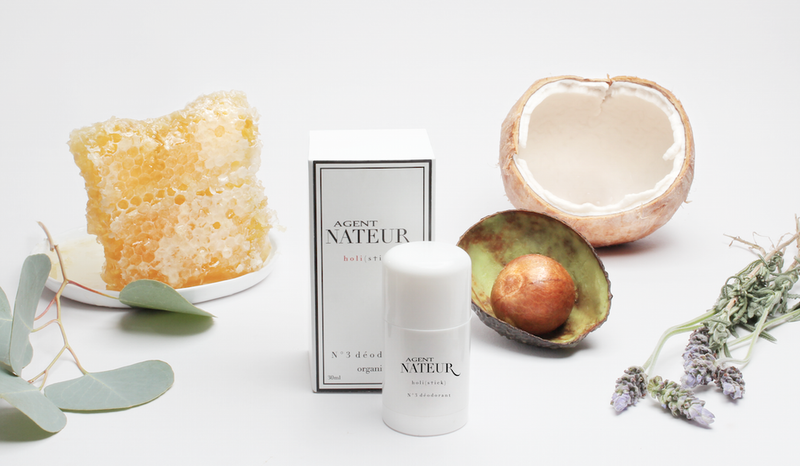 Jena Covello is the creator and #girlboss of Agent Nateur, a new organic deodorant on the scene. 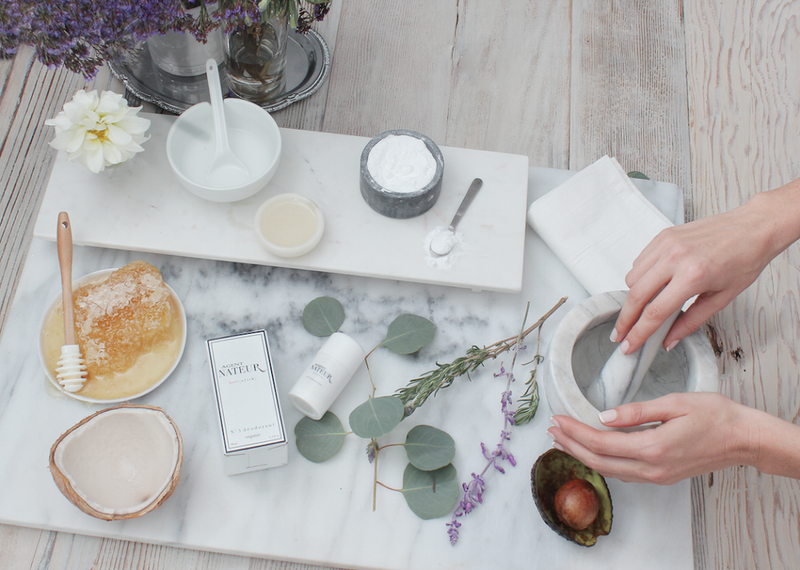 We had the chance to chat with her about how it all started, navigating entrepreneurship and her favorite green beauty brands. Describe your background and what prompted you to start Agent Nateur? My background is fashion. After college at FIT and Parsons, I interned in Italy at the Prada shoe factory and traveled to Europe and Asia up to ten times per year. I was diagnosed with endometriosis in 2003. The disease hindered my ability to travel extensively. I had surgery numerous times and in 2010 I began taking a holistic approach to my health. I attend holistic doctors conferences in Canada and learn as much as I can about the disease and staying healthy. A lot of people underestimate the effects of this painful disease. They are life-altering. I believe in combining western, eastern and holistic medicine when needed. I wanted to find an effective deodorant free of aluminum because aluminum can mimic estrogen and I’m already estrogen dominant. I couldn’t find a single deodorant to work so I began making my own and giving it to friends. Currently I’m the creatrix of Agent Nateur and a celebrity stylist is Los Angeles. How did you choose your ingredients for the (holi)stick and where do you source them from? I knew that baking soda and essential oils were effective against smell and I began to play with different plant and seed butters. I cooked my formula over 100 times. It is very difficult to get an effective natural deodorant in solid form because of the baking soda. It was a lot of trial and error. At one point I used bayberry wax, which was quite effective but after heavy research, bayberry is actually a carcinogen. Just because something is natural does not make it healthy. I also began thinking about ingredients that were natural preservatives- honey, and naturally antimicrobial- coconut oil. 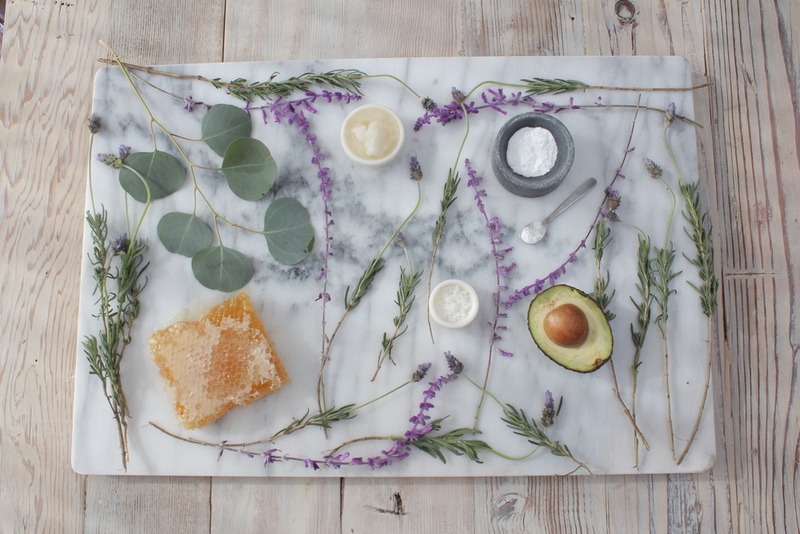 I wanted to create something effective, healing and moisturizing. It took me nine months to find an honest lab who won’t add toxic ingredients to my formula. I am still cooking the deodorant in my kitchen but it’s getting hard because my orders grow each week. My ingredients are only organic or non gmo. There are no pesticides. The ingredients are so pure that you can eat them. I’ve heard that baking soda can irritate some people but my advice is to stick it out and to shave the night before. Eventually the rash will go away. Also, initially apply it when you’re clean and not sweaty. Then you can reapply as needed. Creating an effective formula in stick-form and finding a lab who won’t tell me that my formula can’t be made without toxic preservatives. Most labs are completely unethical. They lie and have a very old-school mentality. They won’t try something natural and non-toxic that hasn’t been done before because they have certain standards to stabilize and preserve a cosmetic product which they believe can only be achieved with synthetic stabilizers, preservatives and toxic chemicals. So in essence I’m reinventing the wheel. Labs are afraid of that. Raw, Organic honey is an important ingredient in the (holi)stick, what are your thoughts on the current bee situation? It’s a natural preservative which means Agent Nateur can have a shelf life of one year without a synthetic preservative. I’d rather add a drop of honey instead of a toxic preservative. Raw organic honey is also extremely antibacterial and healing. The amount I use is extremely minimal as I’m aware that pesticides are killing honeybees. There are ways in which people can help. You can have nectar plants in your own gardens so your local bees have the food they need, you can reduce the amount of pesticides you use by only buying organic and you can support companies that support bee research and breeding programs. Another ingredient I use is beeswax because I refuse to use anything with petroleum- a base in many deodorants and beauty products. Not only is petroleum damaging our planet and killing our animals, it also contains a ton of toxic heavy metals that are major carcinogens. High temperatures created by petroleum causes acid rain, which kills trees and acidifies lakes and kills fish. Coral Reefs in the world’s oceans are killed by acidic water caused by acid rain. What are your favorite brands/products outside of Agent Nateur? Le Labo perfume and lotion, Retin-A, Egyptian Magic and Cosmedix Vitamin C Powder. My holistic dermatologist, Julia Hunter in Beverly Hills has an incredible line of organic, holistic products that she formulates herself. Her serum and pomegranate peel are wonderful. I also use her sunscreen and nighttime eye cream. I don’t have a favorite body cleanser or scrub so I’m making one. I love Jane Iredale’s pressed face powder and currently I use Malibu Hard Water Shampoo and Conditioner. Our water in LA is awful. My friend Dineh created an awesome line of nail polish called Smith & Cult. I know she eliminated the most toxic ingredients which I commend her for! What have you learned about yourself since starting your own company? This is the second company I’ve started. The first was a children’s lifestyle brand. I’ve learned that you know in the first few months if you have a viable product. Also, the company you keep has a lot to do with your success or lack of success. Be mindful of that. Your environment is sacred and needs to be protected. If you could give advice to female entrepreneurs that are just starting out, what would it be? Be prepared to fail and don’t take it personally. I held on to my children’s company for five years because I didn’t want to fail. I had amazing press, I was in every magazine and every celebrity kid wore my brand, but none of it mattered because I couldn’t sell it. As soon as I was okay with failing and let go of my ego, I created Agent Nateur accidentally. Don’t be afraid to close the door. Another one opens. If you’re an entrepreneur, know yourself. When you truly know who you are and what your aesthetic is, you’re able to create something authentic that you can share with the world. If it’s coming from an authentic place, how can you possibly fail? The last piece of advice I have is to focus on the big picture and what you want instead of getting caught up in the details. I’ve lived in West Hollywood for over 9 years but I was raised in a very small, basic town in New Jersey. I see a lot of people moving to LA from small towns to pursue their dreams but they freak out when the dream doesn’t happen overnight. They have to realize that there will be days you will starve if you’re going out on your own and don’t have a trust fund to support you. It’s just part of the process. It makes you strong and tells for a great story! Don’t give up and keep going. Eventually the hard work pays off. Take it from me…there was a time my vintage Jaguar broke down and I had to drive to George Clooney’s house in a red Dodge Caravan for a styling job. Talk about humiliation. There were days I stopped at PR showrooms to eat out of the candy bowl because my account was negative. But all of those experiences and basically losing everything made me more determined to make it and got me to be really authentic with who I was. When you’re tough, nothing can phase you. Entrepreneurship prepares you for tough times and gives you the strength to manage whatever is thrown your way. I always look at other successful female entrepreneurs and say if they can do it, so can I. I’m a huge proponent in following your heart and dreams at all costs. Work hard, be yourself, know your worth and don’t give up. The universe will eventually reward you for that. Do you have any plans to expand beyond deodorant in the future? Yes, I’m working on a body cleanser right now and I’m going to school in Grasse, France very soon to learn how to make perfume and combine scents. 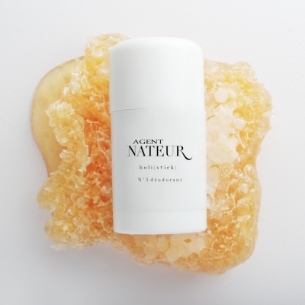 The (holi)stick by Agent Nateur is available in the Clean Beauty Box, DETOX. Click here to check it out.